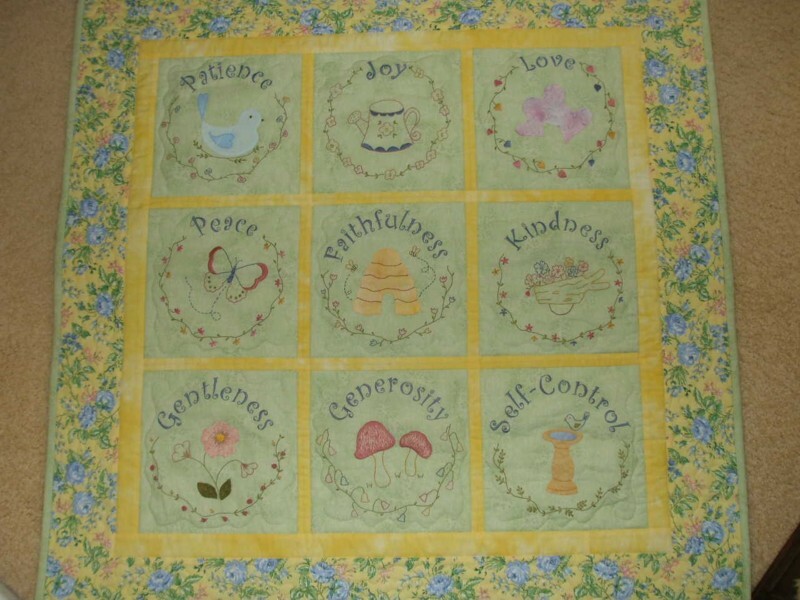 A couple more lovely ladies have sent photos of their Gifts of Grace quilts. This is Lyn's gorgeous version - aren't the colours beautiful? 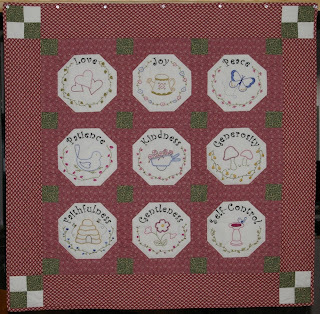 And look what Helen has done with her beautifully embroidered blocks. Aren't those snowball blocks clever? I just love seeing the beautiful interpretations you have put on my design. 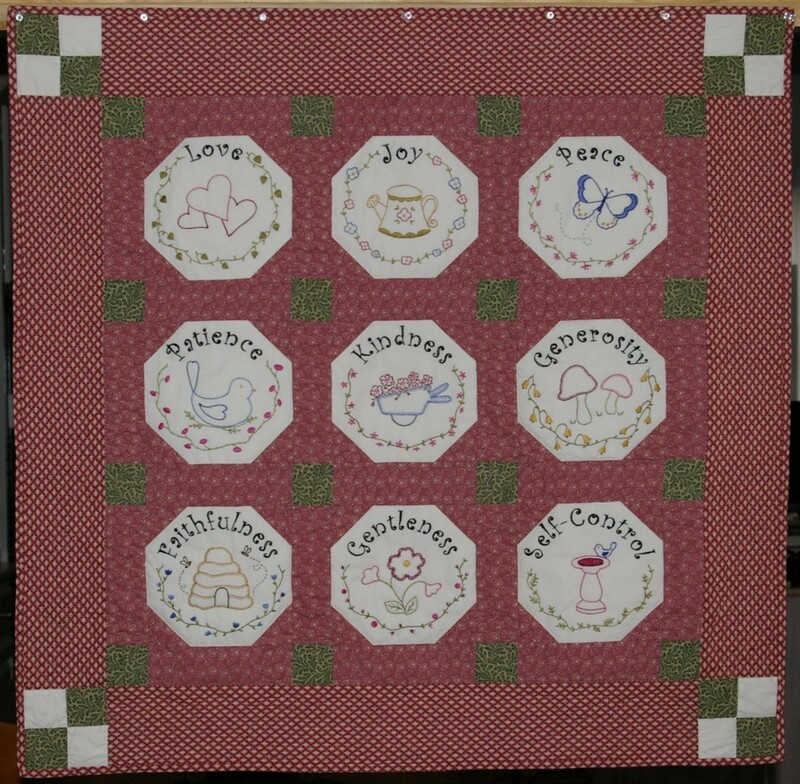 The free pattern will be on the website until 31st December, so hurry in to download all the blocks. Meanwhile I am working on another free BOM which I plan to give you in January. It's looking very sweet, so I think you will like it. My computer is still at the doctor's - SIGH! ﻿Oh well, at least I have my husband's computer I can grab to do some blogging if he's not using it. I managed to complete another couple of Christmas presents, which means everything is now ready with just a few more presents to wrap and put under the tree. This week I feel like a happy mother hen with lots of my chickens under my wings. Daughter No 1 arrived home from overseas this morning for a few weeks, and Daughter No 2 and her four children will be here very soon. Last night we babysat Son No 2's two boys. So with lots of family around, it's time for me to take a little blogging break for a couple of weeks. I hope you have a wonderful Christmas and that you can pause long enough in this busy season to contemplate the wonder of God's love in sending Jesus. I'm so excited to win this!!! Thank you for having the giveaway!!! Enjoy your family and have a very blessed Christmas!!! Merry Christmas to you and yours, Val!! Thank you so much for the patterns for the Graces. I will be finishing mine up in 2011. I don't know how time goes by so fast. Thanks so much for sharing your creativity with all of us. Congratulations to the winners and enjoy a very happy family time. 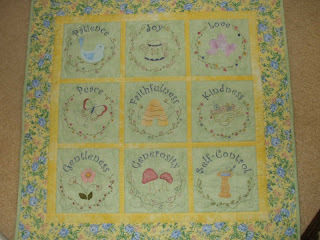 Downloaded the whole quilt...going to start on it this week. Can't wait to see the new one! Both of them are so beautiful! Good for you on getting everything done - I'm almost ready to start, lol. I hope you have a lovely, and very blessed Christmas, Val! Seeing those lovely finished quilts is a great reminder to have a search and destroy mission to find the two pens I went to great lengths to buy. I even got up to see if they could possibly have been put away in their correct home.......alas..no. But find them I shall and then trace I shall and then I shall have some nice stitching for air conditioned nights. Be strong in the gift of grace.. I hope you have a wonderful Christmas too Val! Congrats to the winners! Enjoy your wonderful family Val and have a Blessed Christmas. Congratulations to the winners! Merry Christmas and thank you for such a sweet giveaway. Such a lovely site and patterns. Thank you for sharing Graces. Merry Christmas to you and yours.